Isma'il Pasha, known as Ismail the Magnificent, was the Khedive of Egypt and Sudan from 1863 to 1879, when he was removed at the behest of the United Kingdom of Great Britain and Ireland. Sharing the ambitious outlook of his grandfather, Muhammad Ali Pasha, he greatly modernized Egypt and Sudan during his reign, investing heavily in industrial and economic development, urbanisation, and the expansion of the country's boundaries in Africa. Potpourri or Pot-Pourri is a kind of musical form structured as ABCDEF..., the same as medley or, sometimes, fantasia. It is often used in light, easy-going and popular types of music. Aida met with great acclaim when it finally opened in Cairo on 24 December 1871. The costumes and accessories for the premiere were designed by Auguste Mariette, who also oversaw the design and construction of the sets, which were made in Paris by the Opéra's scene painters Auguste-Alfred Rubé and Philippe Chaperon (acts 1 and 4) and Édouard Desplechin and Jean-Baptiste Lavastre (acts 2 and 3), and shipped to Cairo. 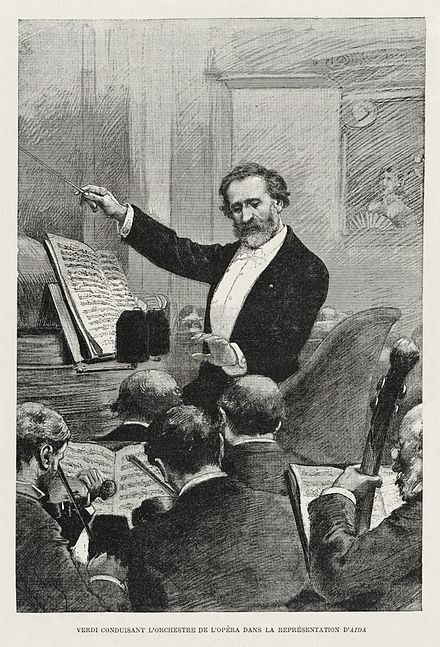 Although Verdi did not attend the premiere in Cairo, he was most dissatisfied with the fact that the audience consisted of invited dignitaries, politicians and critics, but no members of the general public. He therefore considered the Italian (and European) premiere, held at La Scala, Milan on 8 February 1872, and a performance in which he was heavily involved at every stage, to be its real premiere. Philippe Chaperon was a French painter and scenic designer, particularly known for his work at the Paris Opera. He produced stage designs for the premieres of numerous 19th-century operas, including Verdi's Don Carlos and Aida, Massenet's Le Cid, Saint-Saëns's Henri VIII, part two of Berlioz's Les Troyens and the first performances in France of Verdi's Otello and Rigoletto and Wagner's Tannhäuser. Giovanni Bottesini, was an Italian Romantic composer, conductor, and a double bass virtuoso. Radamès has been taken into the lower floor of the temple and sealed up in a dark vault, where he thinks that he is alone. As he hopes that Aida is in a safer place, he hears a sigh and then sees Aida. She has hidden herself in the vault in order to die with Radamès (Radamès and Aida: "La fatal pietra sovra me si chiuse." / The fatal stone now closes over me). They accept their terrible fate (Radamès: "Morir! Si pura e bella" / To die! So pure and lovely!) and bid farewell to Earth and its sorrows. Above the vault in the temple of Vulcan, Amneris weeps and prays to the goddess Isis. In the vault below, Aida dies in Radamès' arms as the priests, offstage, pray to the god Ftha. (Chorus, Aida, Radamès, Amneris: "Immenso Ftha" / Almighty Ptah). Herva Nelli was an Italian-born operatic soprano. Dolora Zajick is an American mezzo-soprano opera singer who specializes in the Verdian repertoire. Zajick has been described as having "one of the greatest voices in the history of opera". Adam Didur or Adamo Didur was a famous Polish operatic bass singer. He sang extensively in Europe and had a major career at New York's Metropolitan Opera from 1908 to 1932. The Philadelphia Civic Grand Opera Company (PCGOC) was an American opera company located in Philadelphia, Pennsylvania that was actively performing at the Academy of Music between 1950 and 1955. Fausta Cleva served as the company's first General Director and conductor. The company's first performance was of Camille Saint-Saëns's Samson et Dalila on January 24, 1950 with Giovanni Martinelli as Samson, Blanche Thebom as Dalila, Martial Singher as The High Priest of Dagon, and John Lawler as Abimélech. 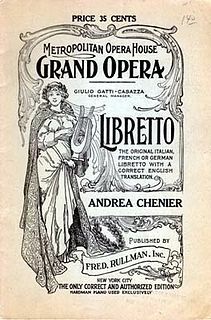 Other operas presented that season were Cavalleria rusticana, L'amico Fritz, and Carmen. Nicola Zerola was an Italian operatic tenor who had an active international career from 1898-1928. 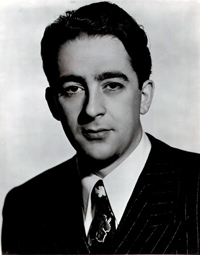 He began his career in his native country, but was soon heard in concerts and operas internationally during the first years of the 20th century. In 1908 he relocated to the United States where he was active with important opera companies in New York, Chicago, and Philadelphia up into the late 1920s. In 1910 he recorded several selections from Verdi's Otello for the Victor Talking Machine Company. He also made 11 solo recordings and one duet for the Gramophone and Typewriter Company in 1910-1911. Orlin Anastassov is a Bulgarian opera singer with an active international career performing leading bass roles. A winner of the 1999 Operalia competition, he has also performed many times as the bass soloist in the Verdi Requiem. Bruna Castagna was an Italian mezzo-soprano. ↑ Auguste Mariette to Paul Draneht (General Manager of the Cairo Opera House), Paris, 28 September 1871. (Translated and annotated ), Busch (1978), pp. 224–225. ↑ The Cairo Opera House could only hold 850 spectators (Pitt & Hassan 1992). 1 2 3 4 Casaglia, Gherardo (2005). "Aida performance history" . L'Almanacco di Gherardo Casaglia (in Italian). ↑ McCants, Clyde (2005). Verdi's Aida: A Record of the Life of the Opera On and Off the Stage. McFarland. ISBN 978-0786423286. ↑ Busch, Hans (1978). Verdi's Aida: The History of an Opera in Letters and Documents. University of Minnesota Press. ISBN 978-0816657155. ↑ Phillips-Matz 1993, p. 628. ↑ "Biography of Josephine Schefsky at theaterspielen.ch (in German)" (PDF). Archived from the original (PDF) on 2012-02-27. Retrieved 2009-09-28. ↑ Loewenberg 1978, column 1019 (exact date, language). ↑ Wolff 1962, p. 27; Phillips-Matz 1993, pp. 652–653. ↑ Collins, Liat (4 June 2011). "Conquering Masada". The Jerusalem Post . Retrieved 19 May 2016. ↑ Christiansen, Rupert (9 December 2006). "Zeffirelli's triumphant Aida at La Scala". The Daily Telegraph . Retrieved 19 May 2016. ↑ BBC News (11 December 2006). "Booed tenor quits La Scala's Aida". Retrieved 19 May 2016. ↑ Day, Michael (9 October 2014). "Franco Zeffirelli takes on La Scala: Legendary opera director in battle with theatre over sale of one of his 'greatest' productions to Kazakhstan". The Independent . Retrieved 19 May 2016. ↑ Operabase. Performances during the 2008/09 to 2012/13 seasons. Retrieved 19 May 2016. 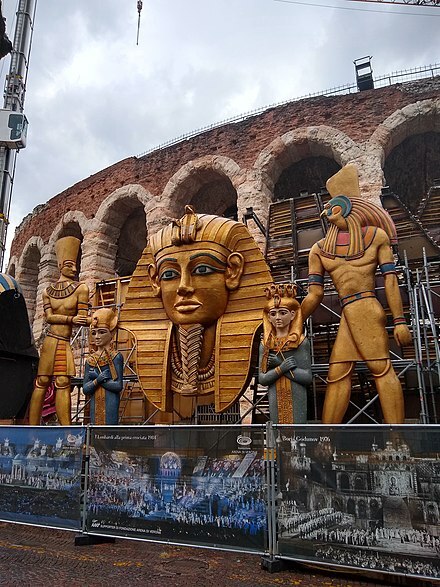 ↑ "Aida alla recita 14 per l'opera Festival 2018" (in Italian). Economic Veronese. 23 August 2018. Retrieved 27 August 2018. ↑ Casaglia, Gherardo (2005). "Aida, 8 February 1872" . L'Almanacco di Gherardo Casaglia (in Italian). ↑ The High Priestess's name was Termuthis in early documentation. 1 2 "Aida and Ancient Egyptian History on the Met Opera website". Archived from the original on 2003-05-03. ↑ The original draft included a speech by Aida (excised from the final version) that explained her presence beneath the Temple: "My heart knew your sentence. For three days I have waited here." The line most familiar to audiences translates as: "My heart forewarned me of your condemnation. In this tomb that was opened for you I entered secretly. Here, away from human sight, in your arms I wish to die." Wolff, Stéphane (1962). L'Opéra au Palais Garnier (1875–1962). Paris: Deposé au journal L'Entr'acte OCLC 7068320 , 460748195. Paris: Slatkine (1983 reprint) ISBN 978-2-05-000214-2. Wikimedia Commons has media related to Aida (opera) .